It breeds on Antarctic coasts, usually laying two eggs in November and December. 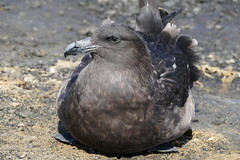 It is a migrant, wintering at sea in the Pacific, Indian and Atlantic Oceans. In the eastern North Atlantic it is replaced by the great skua.